Perhaps I should explain why I built it. During pre-production time for TRAUMA, I wasn’t exactly sure how how I would use photos in that game. 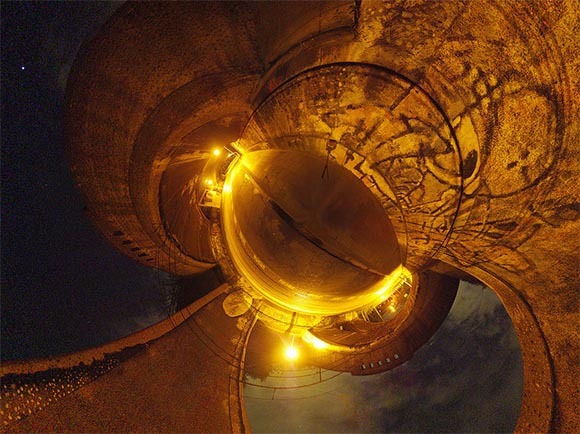 For a time I considered shooting spherical panoramas. I would shoot a collection of carefully overlapping photos from one specific location and then use Image stitching software to construct the panoramas. However, the process was laborious. I would have to shoot dozens of the panoramas and it was very easy to make a mistake and miss a spot. 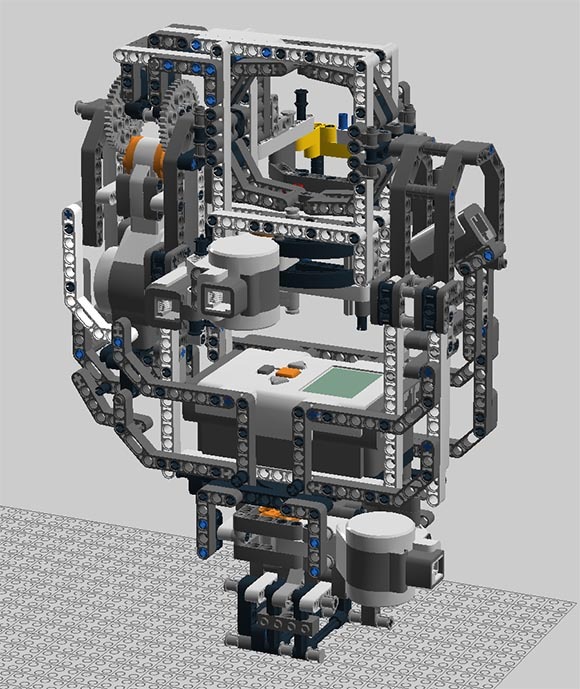 I was experimenting with LEGO Mindstorms at the time and I ended up building the Panobot. I already made some attempts previously and collected the right parts to pull it off. It still took me over a week of full-time building. I had to re-design the thing multiple times due to structural integrity issues. It was custom-built for my Sony F-717 Camera and a small Sony camera tripod I had. The robot clamped on top of the tripod. The camera would be inserted into the robot itself. The weight of the camera pushed the plastic of the pieces to their limits. The biggest problem turned out to be at the base of the tripod. The whole thing needed to turn at the base. Sadly, the only available LEGO piece for this job is just the flimsy turntable. I ended up fusing two of those together in a quite complicated fashion. It was barely enough. But for some time I developed an obsession to improve upon the design even further. The turntable-problem is a well-known issue in the LEGO community and there are some rather surprising solutions for it. 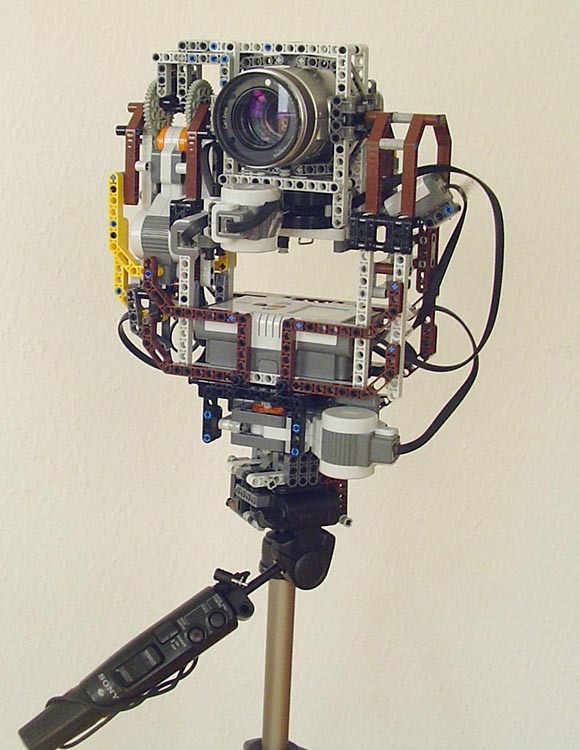 The original Panobot with the camera inserted and attached to the tripod. But for the time being my preliminary version sufficed and I was able to shoot some interesting test-panoramas. The Panobot worked quite well. I did run into some battery issues. The battery lasted only for a handful of panoramas. Also, the lack of structural integrity made the whole thing shake horribly whenever there was a gust of wind. But it was usable. The only thing that really stopped me from fully taking advantage of it was my decision not to use panoramas in TRAUMA after all. One of the many panoramas I shot with it. This is from a location that ended up being in the actual game. If you look closely you can even see the shadow of the tripod. I don’t think I will be improving upon the design, since today there are much cheaper and more reliable commercial solutions available. However, it is a cool memento and an interesting build to experiment with. So if you want to check it out, you can download the digital model of it here. It can be opened with the LEGO Digital Designer.